What is Sufism? What are its manifestations today? What do the life and practices of Sufi look like in Pakistan, Iran, Arab countries, and Central Asia? Do Sufi practices differ in specific nations? What is the impact of Sufism on people’s lives, culture and customs in different countries? Marcin Krzyżanowski (Institute of the Middle and Far East, JU). The debate (in Polish) will be moderated by Miron Kokosiński, historian and cultural studies scholar. At 7:15 pm, the debate will be followed by a concert of Sufi music and choreography from Iran. The Hamdam Trio is a joint project of prominent Iranian musicians headed by Dariush Rasouli (ney), with Arad Emamgholi (daf and dajereh) and Sadollah Nasri (vocals, diwan), both of Sanandaj in Iranian Kurdistan. The trio have performed with much success all over Europe. 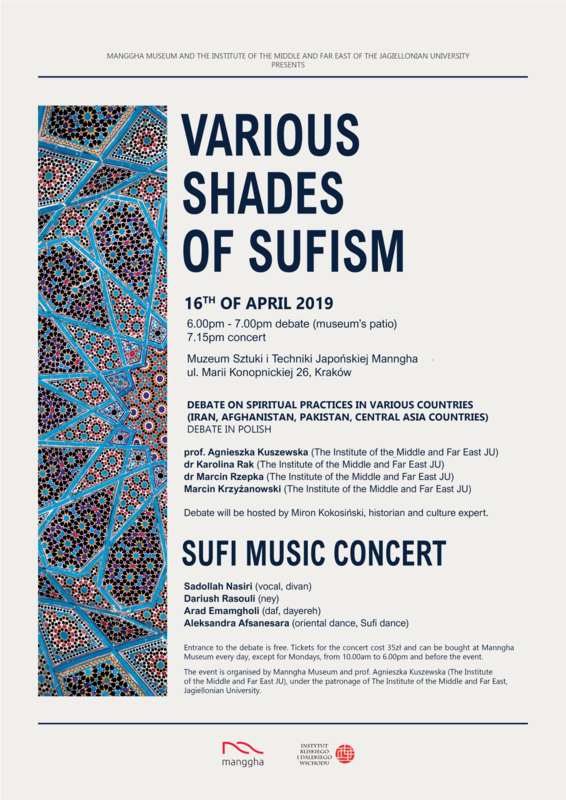 The musicians focus on Sufi music based on Iranian mysticism. Sung in Kurdish and Persian, most of these compositions are about love and man. Music and song will be enhanced by dances performed by Apsara (Aleksandra) Afsanesara, a professional dancer and choreographer specializing in the dances of the Silk Road lands (Persia, Afghanistan, Central Asia, and India). Tickets, priced zł35, can be purchased daily at the Manggha Museum except Mondays, between 10:00 am and 6:00 pm, and directly before the concert. Admission to the debate is free and open to the public. The event is organized by the Manggha Museum and Professor Agnieszka Kuszewska (Institute of the Middle and Far East, Jagiellonian University).